We gather our many dimensions in an experiential journey ushering out whatever lingering places 'chametz'' (puffed up) remained within with gratitude, cleansing the space, and creating clear intentions of how to deepen our inner altar cleaning; then we listened into emerging practices to journey into Passover through the Omer. It was sweet to gather around the altar upstairs, recount the upcoming festival fusing early gatherings of shepherds and farmers, journey through the four worlds from ancient mitzrayim to today's modern world, pilgrimage in the shul through the four phases of liberation, burn our shackles amidst the sunset and bless each other for nurturing our vessels into vehicles for individual and collective liberation. We joined in circle back to aboriginal Judaism when worship was rooted in earth practices, living tree reverence, embodied Goddess presence, and magical ways still going. We delved into, between and beyond texts written and oral while exploring different names of Divinity and Jewish archetypal approaches that reveal the Mother roots of Judaism. We discovered ways to open and reactivate these portals for the transformation of patriarchal patterns rooting society's dysfunctions and corresponding earth community healing arising. Shoe B'Shevat, hosted by Roots and Trails & Beth Jacob Synagogue. Jan 26; 6:30-8pm at NBranch Nature Center -713 Elm Street, Montpelier, VT. After a sweet havdallah ritual, we shared in a contemplative snowshoe journey under the full moon tree silhouettes by the river to listen to and bless the trees under the vast milky way. We gathered inside afterwards to share in a mini Kabalistic 4 world seder joining in the opportunity to replenish nourishment lifecycles and practice our redemptive prayers which allow us to partner with the Living Tree of Life. Monthly Rosh Chodesh Circles co hosted by Roots and Trails and Congregation Ruach HaMaQom @ the new moon date in shul or nature nearby. We gather in sacred space, confidential and aligned with themes from our ancestral calendar. A general structure of circle casting, introductions, chants, prayers, teachings, experiential activities, sharing, discussion, reflection, and closing will be followed each month with rotating facilitators as the circle evolves. This circle is for all who identify as a female. Each circle's end we will choose the next date & facilitators. Currently Yepeth Perla collaborates with others in co-facilitation. Youth from the Congregation Ruach HaMaQom circled to share in a vibrant service in which we acknowledged the fragility of life, oriented towards shma guidance to listen, explored the concept of repentance, pair shared about transgressions we each committed, drew and discussed the story of Jonah, investigated what we know about our individual missions on earth and what might be blocking us from fulfilling them, brainstormed ways to move through any stumbling blocks, and wrote blessings for each other and the community. As we allowed the wind, waves, rocks, plants, and earth to hold us we released into clarifying our places in the collective and individual spectrums of time and space Atonement. Youth from the Congregation Ruach HaMaQom circled outside to share in an experiential service involving rocks, water, our hearts, souls, minds, and community fabric as we gathered along the lake shore in prayer, exploring what we need to forgive in ourselves and each other. The service flowed in prayer song, pair shares, reflective activities, confessions, intentions, and revelations about parts of ourselves we are still figuring out with the wind and waves. We met at the large white ash tree right of pavilion if you are facing the lake in creative circle to usher in the eve of Rosh Hashanah, the head of year: 5779. As we ushered out 5778 with gratitude and reflection, we turned furthur into the cycle of life in sacred space, playing with lakeshore's sand and rocks to redraw our trails up until this moment, witnessing each other with curiosity, immersing in the Lake Between's cleansing waters through the ancestral ritual known as a 'mikveh', discovered quiet spaces on the landscape and in ourselves to nurture and listen through, gathered in seed planting and candle lighting to welcome in blessing opportunities on setting sun horizon. Monday June 18th Rockpoint Summer Camp Staff Training; 10am-4pm; Counselors experienced the flow of the day through core routines grounded in gratitude, observation, play, listening, crafting, reverence, and sharing. Following their curiosity and discovering bird language, tracks, buds, medicine, fungal hyphae, & geologic wonders. 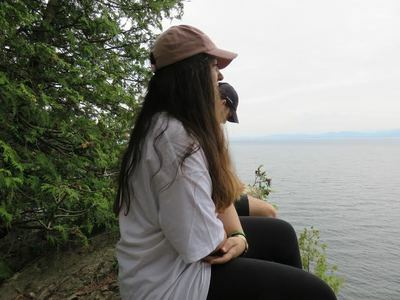 Emergent properties such as First Nation inhabitant acknowledgement, emotional and physical safety, balance between essence connecting and scientific identifying, intuitive vs. wilderness skill honing arose as the landscape guided our learning process. Counselors set intentions individually and as a team, reflecting on throughout the day as they grew skills and awareness in holding a container for their campers to breathe in, out and through. We joined together in circle to explore the healing patterns of this moon, the refining opportunities of the Omer counting, the joys of self care through herbal facials, tea, and footbaths, and the support in sharing with each other as witnesses in the journey through the wilderness. March ​25th at Congregation Ruach Ha Maqom; 168 Archibald St, Burlington, VT 05401 6:30-8:30 pm Preparing and purifying for Pesach. 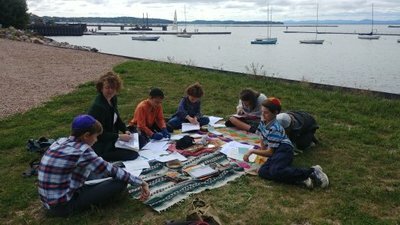 We gathered to explore what aspects of our inner and outer sanctuaries still contain vestiges of 'chametz' and experiment with a few cleansing techniques and teachings to release them in the synagogue. We then took our 'internal chometz' workshop work down to the lake where we participated in ancient & modern purification rituals of (Bedkat Chametz, Buir Chametz, Mikveh, and Bracha Chametz), allowing the elemental wheel to assist us in our cleansing amidst the setting sun, rising moon and stars, under a cottonwood tree. This opportunity allowed us space, mediums and community within which to identify, embrace, and let go of obstacles to create more space for liberation trails in the coming journey. 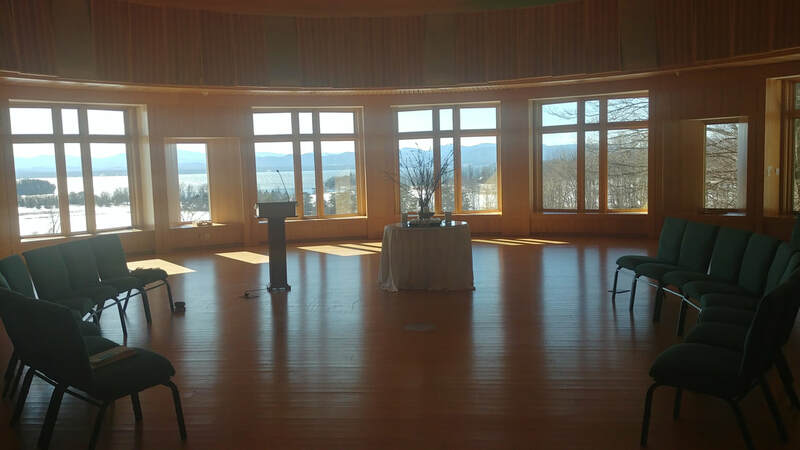 March 25th at All Souls Interfaith Gathering; A Vermont Spiritual Center 291 Bostwick Farm Rd.Shelburne, VT 05482 Uncovering Freedom 5-6pm. ​This week's service spoke about attuning to the possibility that the backdrop of our lives consists of breathing harmonious unity, holding it all together as we align with the season of spring and freedom, we witness how we minor adjustments, reveal this underlining peace. Co-creating , and inviting space to identify these portals is a present opportunity. Music accompanied the service and All Souls minister Kim Marie Glynn wove the service together with Yepeth Perla via quotes and meditation. Join us and breathe in the freedom! 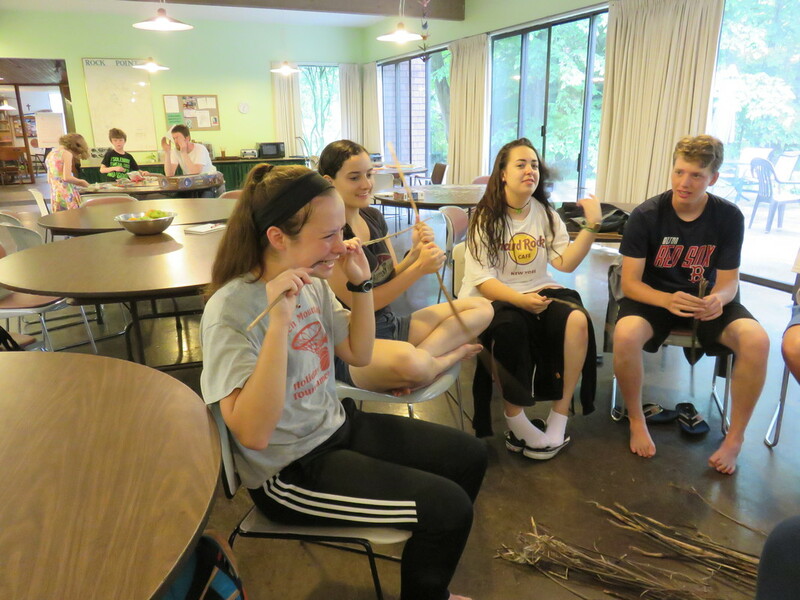 To read the Dvar that YP delivered that day click on the Torah Musings. ​​March 18 6:30-8:30 pm at Congregation Ruach Ha Maqom; 168 Archibald St, Burlington, VT 05401 Coed New Moon Circle. Near the new moon of Nissan we circled in safe, confidential ritual space, exploring where we are caged and where we are free in our lives through experiential activities and discovered portals to identify strategies to increase liberation throughout our trails. We aligned with this month's themes of spring and release as well as witnessed and supported each other across the threshold into this spiritual new year. Shoe b'shoat-snowshoe celebration of the New Year of the Trees (Shevat 14) Tuesday, January 30 at 6:30-8pm North Branch Nature Center 713 Elm St. Montpelier VT. 12 hardy souls joined us to snowshoe across the frozen field and riparian landscape amidst the rising Super Blue Moon. We listened, shared song, poetry, and blessings. This collaboration between Roots & Trails & Beth Jacob Synagogue ended in the nature center where we enjoyed delicious tree gifts with prayers and stories. Jan 31 (Shevat 15); 5:30 - 7:30 pm at Ruach Ha maQom Shul 168 Archibald St, Burlington, VT 05401. Tu B'Shvat blessing way. 7 of us gathered in the shul to explore the Divine Feminine roots of Tree of Life honoring and journeyed out into the local cemetery to explore the spaces between our departed and living beings hanging between the bookends and amidst the scaffolding of the Tree of Life as we danced amidst, cuddled in, breathed with, listened to, blessed, and thanked the tree kin there. We warmed up and grounded in the shul to realign with the sap rising within our lives. January 17th (Shevat 1); 6-8:00 pm at Ruach Ha maQom Shul 168 Archibald St, Burlington, VT 05401. Coed New Moon Circle. We welcome in the Shevat new moon in a conscious, confidential, & sacredly held circle. Through a dynamic ritual infused with mystical teachings we learned about the qualities of this month allowing space for intention setting, individual & collective sharing, & exploration into what is shedding and arising in our lives. We journeyed deep into our inner landscapes nested within the infinite caverns in the synagogue walls. Expanding our personal containers to distribute the harvest equitably. (Saturday: Oct. 7; 'Sukkot on the Farm' Living Tree Alliance Cohousing Community, Moretown, VT) We investigated our individual inner architecture to see how well we each are equipped to meet today's challenges. We then encountered the 13 Netivot, archetypes identified through the Kohenet Institute. Through this process we explored where we are and not abundant in our lives and how we can we grow abundance to share the overflow with where it can be most healing. Exploring how connecting with many faces of the Divine can inform our service in planetary repair. We shared about our backgrounds in relationship to Divinity (however participants understood/defined this term). We then encountered 23 Divine Feminine names (often harnessed in the Kohenet path that YP is ordained in) and investigated how these delighted, triggered, invited, repelled or otherwise inspire us in new or old ways of aligning our efforts to create more harmony in the world. Yaffa and Elliot co piloted this workshop (our first official collaboration) in which folks of all ages joined us to explore sensory meditation, conscious walking, intuitive tracking, gratitude, and harvest reflections through nature awareness activities linked to our ancestral pathways wandering in the desert and taking shelter in Sukkas of gratitude along the way. 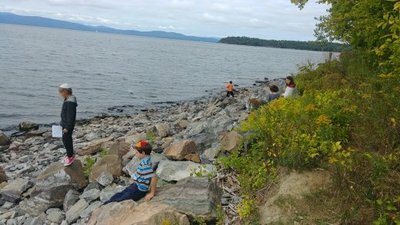 Several youth and parents joined Yaffa and Melanie in a conscious walk through the gorgeous ceder woods, along the shore of Lake Champlain, exploring this day of AtOneMent via saying sorry, forgiving, and trying again. 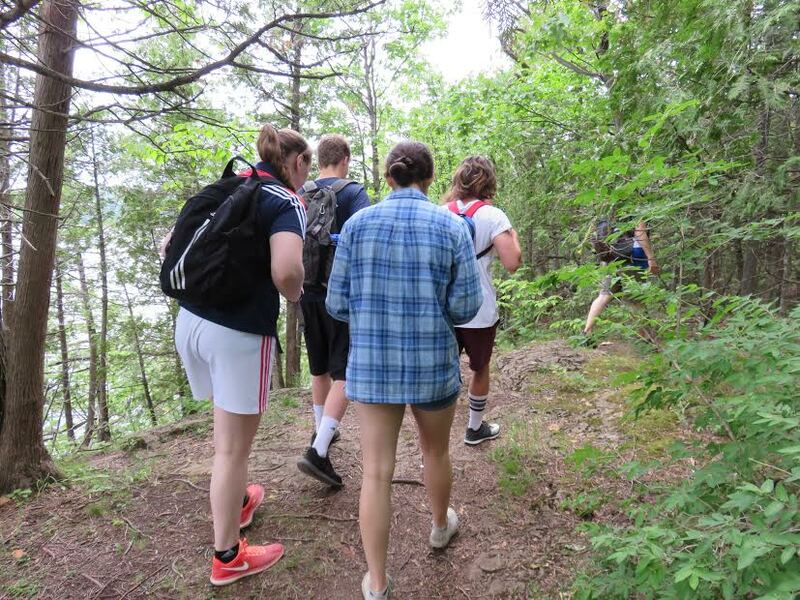 Through various activities along our walk we explored the myriad levels this process involves such as between the individual and the earth, within oneself, between oneself and others, between one and G-d, between oneself and the larger earth community. Participants seemed lighter, more joyful, and more aligned as we returned to meet with those in services. 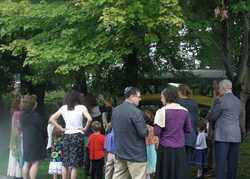 Mothers, Daughters, Sisters...; Paddling Peace Excursion; All Interested In Earth-Based Judaism (June 23-6; Green River Reservoir, Vt) Our group of sisters and mother/daughters revelled in the wild landscape where loon calls were the baseline. We paddled to islands, set up base camp, swam, tracked mammals, met edible and medicinal plants, practiced one match and friction fires, cooked gourmet meals, welcomed in Shabbas, explored many faces of the Divine Feminine, discussed our relationships to Divinity, shared ancient and modern stories, sang songs, prayed, stretched, blessed, meditated at our sit spots, ushered out Shabbas via Havdallah, practiced nature awareness skills, supported a girl as she entered her lily maiden path, learned technical paddling skills, filtered a lot of water, thanked, slowed..
Passover Purifying Our Hearths; All who connect with Divine Feminine (April 17; 11-1pm; Hubbard Park, Montpelier, Vt) We grounded in the center of 9 directions, travelling through the four worlds examining our inner landscape while nested in the clarifying outer landscape. As we investigated and cleared our spaces of 'shmutz', thanked it, buried it and created clear intentions for new liberation for all via our own vessels. Rabbi Tobie Weisman, Rick Swag, and Yaffa guided folks of many faiths to participate in a ritual inspiring freedom of consciousness. We explored how to carry this into our daily lives for all beings. Family Adventure Walk: (April 2, JCOGS, 1189 Cape Cod Road Stowe VT 05672; 10:30-11:30 am) We enjoyed a dynamic time walking through the surrounding meadow edges peering closely into lichen and discovering treasures including a woodchuck among its many tunnels and green leaves unfurling. We honored the Abenaki and language of this land as we also practiced blessing these wonders in our ancestral language. We strolled through the surrounding natural community within which we are nested to play with a few deepening techniques while snow and hail invited our sense to open even more. Our return to inside offered a reminder of how we guide our awareness expanse and our capacity to bless every moment. G-d(dess) Investigation: (April 2, JCOGS; 4:30-5:15) We briefly explored the challenges & opportunities of being Jewish in Vermont touching on the fine line between honoring Shabbas and growing community with our friends, if Kosher is Kosher to us if it hurts the land & animals, how we navigate holding sacred space for our tradition while in close proximity to those who hold other sacred spaces, and our individual links to Divinity. A Teen Conversation: Reframing Israel (April 2, JCOGS, Stowe, VT; 11:00-12:30) We gathered for an open conversation about the his(her)story, challenges, and current dynamics of the land, people, and state of Israel & Palestine. We learned a lot more about the topic and our struggle with understanding it. Exploring Many Faces of the Divine: (April 3, JCOGS, Stowe, Vt; 1:30-2:30 pm) Folks journeyed into different dimensions of the Creator; exploring and sharing what names they resonated with and which ones challenged them. Spicing up Jewish teen life in Vt: April 3, JCOGS, Stowe, VT; 2:30-3:30 pm) Teens gathered to experience a taste of Roots & Trails programming, an introduction to tzedakah work in the area, a view into Young Judeae and an exploration into what we can co-create for a vibrant Jewish teen hub. We journeyed through the winter wonderland together, listening to & praising the trees while deepening our awareness of their seen and unseen teachings. It was neat to practice co-partnering with the trees, to explore ancient practices of communing with trees, and to venture into the four worlds as honored by mystics through a blessing seder in the sunshine on the sparkly snow amidst our holy teachers. Together we journeyed up amidst the autumnal hues through the hardwood and boreal zones while tapping into Judaism's four world and explored how awareness of their presence can deepen our journeys. We were an eclectic group of children, parents, single adults, and an elder. We spaced ourselves out amidst the mountain according to our curiosity and comfort. On the way down we shared Yiddish sayings and explored the descent of worlds and how to navigate gracefully. We joined in interactive workshops including cordage making, no match fire making, carving, and nature awareness. 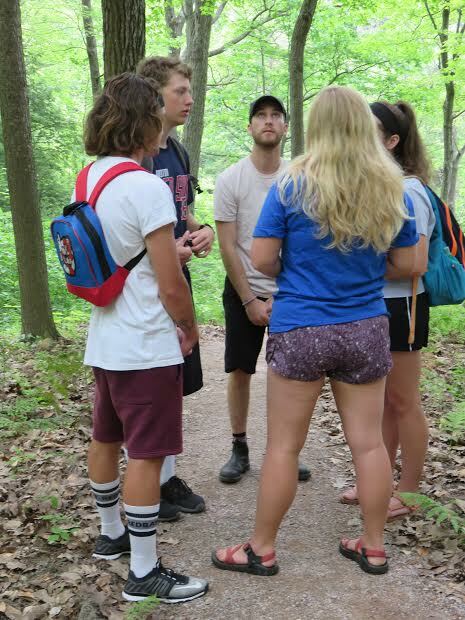 The teens later met in a nook to explore what it means to go in nature and hear original instructions. The brought back rich guidance about ways we can be of service in our community. All are welcome into a dynamic experience singing, praying, sharing stories, and exploring concepts of forgiveness, accountability, intention, and planetary healing. After a brief service exploring the lunar calendar and all that happened this year as well as sharing with each other places we need to forgive or be forgiven, we then joined in a climate ribbon ritual to pledge caregiving ways to earth in praise of Creation. 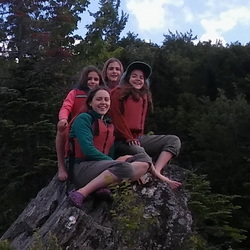 Chabad Pioneers' eldest girls via canoes for a wonderful wet stay on Burton Island on Lake Champlain; VT (June 30-July 1, 2015); they enjoyed davenning, met friends like red rasberry and yarrow, revelled in the wonder of Mars & Jupiter converging, read the deep text of firefly light, explored our silent amidah via woods sit spot, learned to enjoy cold steady rain and wind while paddling towards our future, connected with Miriam's well, and so much more.. 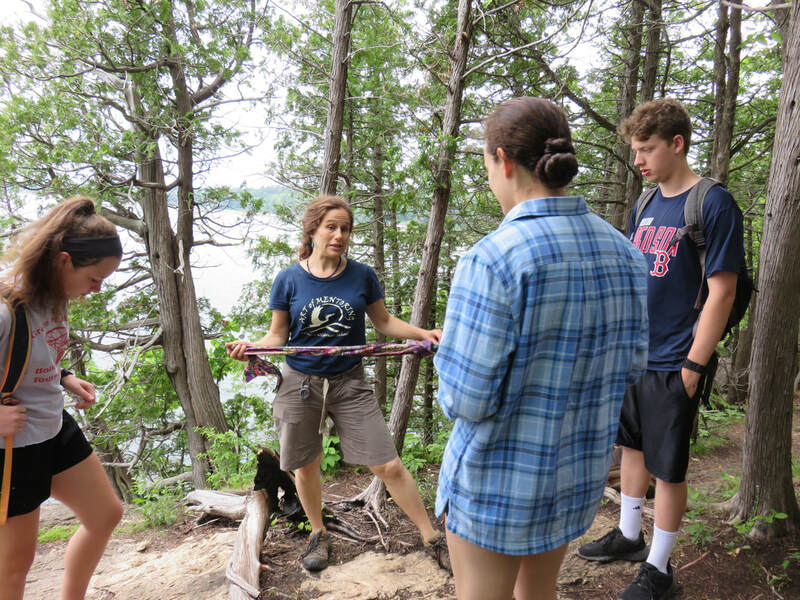 Roots and Trails' 'Tiferet Girls' canoed for three days and two nights (August 12-14, 2015) on Lake Champlain in VT with eight girls and assistant instructor Diana Clarke. We learned classic American Canoe Association strokes (such as sweep, bow draw, forward..) well enough to navigate our boats to Woods and Knight Islands, making sweet camps along the way. We investigated our evolving relationship to Divinity, experimented using female pronouns in our prayers, enjoyed a morning mikveh in the lake, allowed nature to be our guide via wind and waves, were introduced to a bitl of yiddish and Jewish American feminist poetry, met friends such as nettle, rasberry leaf, plantain, and heal all, joined in individual and collective prayer, stretched through yoga, learned to portage, sang tribal songs around the fire, shared about our ancestors, awed under the Perseid meteor shower, learned through each other's stories, began transitioning from the mourning month of Av to the renewing month of Elul and so much more..
Women Within the Wild Series﻿: for women ages 14 & older interested in exploring ancient Goddess practices; rediscovering their transformative potential in today's world. The series begins in December & runs through August. Participants are welcome to take as many or as few workshops as they like. Fees are sliding scale & scholarships are available. Workshops during the 2nd Annual Jewish Intentional Communities Conference: Nov. 20-23 at Isabella Freedman Center in Falls Village, CT. Exploring Ritual in the Home: (9:00-10:15 am) How does your family harness ritual to connect with each holiday season's Divine energy? Come explore with us as we travel through the Jewish calendar together, sharing ideas and practices we do to align & co-create within our tradition's framework. Slowing Down into Shmita: (1:00-2:00 pm) Journey to the forest to find a spot to silently attune to the surrounding wild community & the still, small voice within. Reflect on Shmita and our opportunity to creatively honor it. Share in circle as we witness, support, & inspire each other. Workshops during the Jewish Communities of Vermont Conference: Making Connections:﻿ Sunday, Nov. 2; 9am-3pm in Killington, VT.
﻿Slowing into Shmita﻿: (11:15-12:15 pm) As we enter the Shmita (Sabbatical) year of 5775, we have the opportunity to reflect on & realign our lives in a way similar to how the Sabbath can guide our work week experience. In this workshop we will explore readings from primary and secondary texts to explore what this ripe opportunity offers. We will study how the Jewish environmental movement harnesses this time to reorient our social, economic, and agricultural systems to create a more just and egalitarian world. Through this you may discover ways which feel authentic for you, your family, and your community to participate in this regenerative global initiative. ﻿How Eco-Kashrut Supports Life﻿: (1:00-2:00 pm) While we live during what is known as the 6th Great Extinction, we have the responsibility to choose lifestyle practices which support rather than dismantle earth's life sustaining systems. Jewish principles such as Bal tashchit (protection of the environment), Tza'ar ba'alei chai’im (respect for animals), Sh'mirat haguf (protection of one's own body), Oshek (not oppressing workers) and Shmitah/Yovel (the rhythm of allowing the earth to rest) are key components in what has been coined “Eco-Kosher' by Rabbi Zalman Schachter-Shalomi. In studying the history & process of the “Eco-Kosher Project,” we will grapple with how our observing ethical strands in the Torah within our modern context can orient us to help heal rather than hurt the earth community. Sukkot Festival Workshops: at the Sukkot Festival October 12th at New Leaf Organic Farm in Bristol, VT.
Reflective Women's Meditative Harvest Walk: (10-11:30 am) Come join us as we wander through field and forest in a contemplative meditation as we journey between the outer and inner landscapes of our lives..
High Holiday Children's Services: outside Montpelier's Beth Jacob synagogue in the tent, gathered for Rosh Hashanah and Yom Kippur (10:30-11:15am) to share in song, prayer, story, silence, sharing, and reflection. Parents, family members, and youth of all ages welcome. 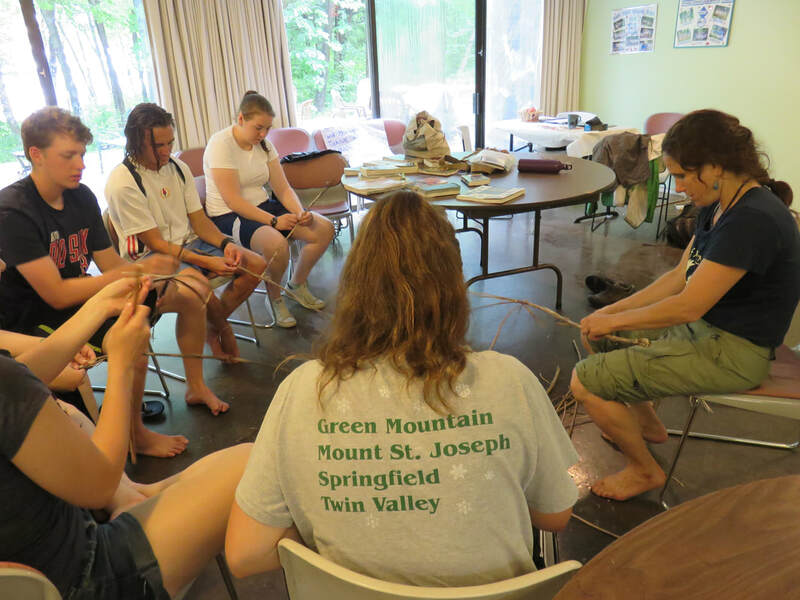 Tiferet Trails Wilderness Girls Series: ﻿for pre to post Bat-Mitzvah age (9-15) girls interested in joining together in village community; practicing ancient skills and crafts while discovering our own gifts and wonder. All abilities, levels of knowledge, and forms of practice welcome.